…and I was very happy with it! So much in fact, I even kept on using it this year. But it did need some tweaking. My schedule’s pretty different this year and has taken a lot of adjusting (as you might be able to see from the notes above). The biggest changes I made are the boxes for Opening, Work Period, and Closing. I wanted it to be easier to see when I was going over my plan for the day…instead of a bunch of writing squished into one box (like I had last year). I’m hoping this will help. I know everyone’s schedule is so different, but in case you would like a template to rearrange to your liking, I’ve shared it below (it’s a Powerpoint file). If you’d like to use the same fonts, they are Belly Button Innie and Coffee Shoppe Espresso. Thanks for inspiring me to tweak my plan book. I currently have a template I created but it looks like the "old fashion" plan book! LOL! 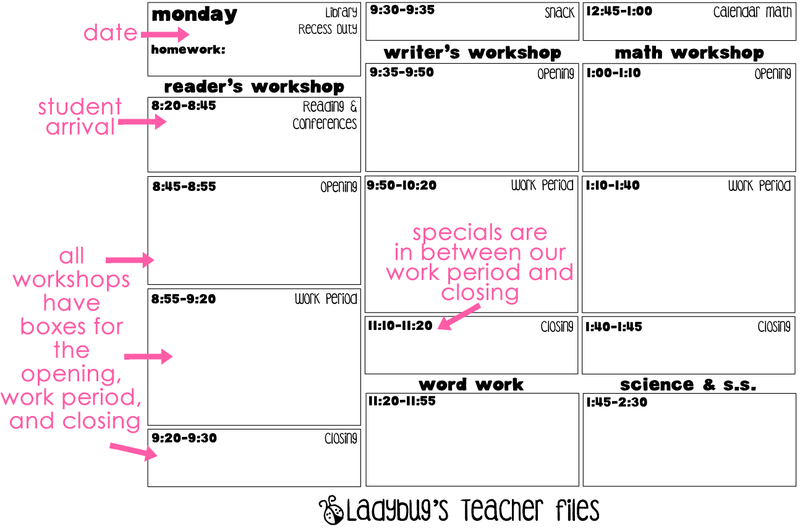 I use Reader's Workshop/CAFE/Daily 5 but I've been struggling with how to write the plans. It just doesn't work for me! Yours has given me some ideas! THANKS so much for sharing! I love this template! Thanks, Kristen! Hmmm…. I usually buy mine at Lakeshore but now that I see so many cute & creative ones like yours, I feel like I might change my mind next year! Thanks for sharing! Thanks for sharing the way your plans work for you. It's funny that you posted this as it was a conversation on my team on Friday~ the need to tweak what we have! Changing my planbook is on my agenda to get to soon! You are so stinkin creative!!!! Thanks for sharing this! Your template from last year is what I use this year and it works so well for my lesson planning needs. I really appreciate you sharing all your goodies with us. Thanks for sharing!! I love the fonts and how it turned out!! Have a great week! I love them. I wish I could plan like this. I am seriously gonna take a good look at it to see if I can do a whole day on one page. Currently I am doing one page per grade level. What a lovely planner page you. I could see that being really helpful to organize your day. Thank you! I love how you schedule he start end end of each workshop, I need to do that to keep me on track. 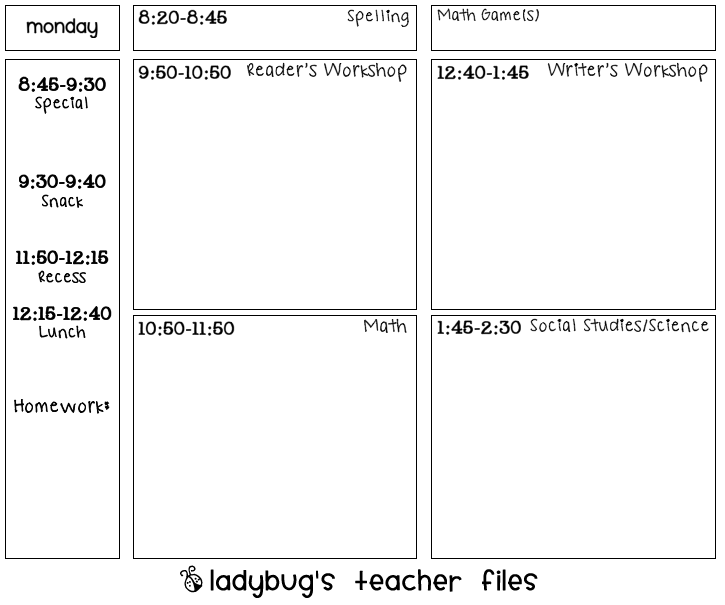 Good template, this template making me to remember my school time table, i used to maintain a good time table in my childhood days, but as usual like all kids i never maintained it. Thank you! I appreciate all of your hard work! Thank you for sharing! I understand why I have to write the uber detailed plans that my district requires of us for each lesson (i.e. : CCSS, Learning Objective, What the Teacher will do, What the students will do, materials, differentiation, assessment…..) but I miss my old block schedule where I could see at a glance how my day is going to play out. I love your idea I think I will just add it as a cover for the district required 15 pages of plans and I'll finally know what the heck I'm doing each day. Thanks again for the inspiration!